Here is a book review I wrote recently for Insight, an in-house publication at the ISB. A good financial crisis is a terrible thing to waste. Especially for historians. I don’t always like Niall Ferguson’s interpretations of history, especially his seeming high regard for imperialism, but the fact is he is one of the most influential historians of the last decade. From his perch at Harvard, this British historian has written about everything including World War I, the Rothschilds, the British empire and the savagery of war in the 20th century. 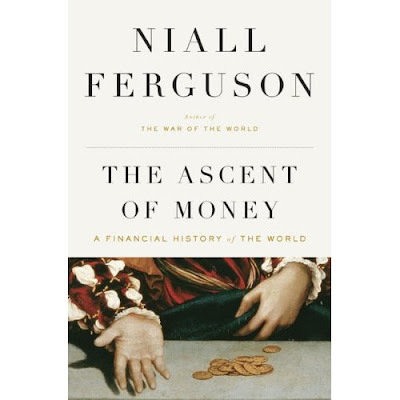 In the Ascent of Money: A Financial History of the World, Ferguson provides an easy to digest financial history of the world. The book is a romp through history from Babylonian credit systems to Pizarro’s search for El Dorado, to the birth of modern banking in Northern Italy, through to collateralized debt obligations and the spectacular collapse of the financial sector in the last year. In the process, Ferguson introduces the reader to colourful characters and interesting historical episodes. We get to meet a Scottish outlaw and murderer named John Law, who Ferguson argues was partly responsible for the French revolution by unleashing a stock market bubble that ended up destroying the French financial system. Ferguson suggests that the Dutch prevailed over the Habsburgs because having the world’s first modern stock market (and access to a thriving bond market) was preferable to owing the world’s biggest silver mine. Most of us believe that it was the Duke of Wellington’s heroics that defeated Napoleon at Waterloo. Ferguson argues that Nathan Rothschild played an equally important part. Apparently, Rothschild used his experience as a gold smuggler to make vast quantities of continental gold available to the Duke of Wellington; paper money raised in Britain was of no use to Wellington to fight a continental battle. Possibly as a result, the Confederacy approached the Rothschilds for financing their campaign during the American Civil War. Was it a genuine distaste for slavery or was it that the confederacy was considered a huge credit risk by all investors? Similarly, how did Great Britain, one of the safest countries on the planet, secure even from the vagaries of weather and geology, end up becoming the most insured country on the planet (12% of GDP spent on premiums)? Turns out the answer has something to do with the decline of the welfare state. Ferguson ends with a chapter on the interplay between the G2 or what he calls Chimerica, the two pre-eminent financial powers of today. In the latest version of globalization, the counter-intuitive flow of capital from east to west, i.e. Chinese savings to American spenders, may well have been responsible for the mortgage market crash. Ferguson’s strength lies in being able to link the past with the present, though I wish he’d have spent a lot more time on the past. Will the current version of globalization end up the way the last version ended, in 1914? What, for instance, will happen to Chimerica if China raises a blue water navy and decides to take over Taiwan? Is history condemned to repeating itself? At a time when finance has been taking a lot of flak, Ferguson provides a robust defence and ends with this coda: “financial markets are like the mirror of mankind, revealing every hour of every working day the way we value ourselves and the resources of the world around us. It is not the fault of the mirror if it reflects our blemishes as clearly as our beauty." 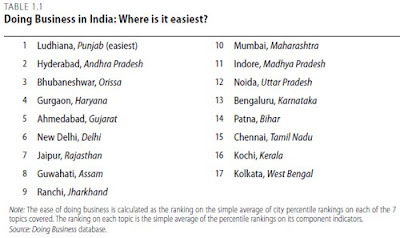 The World Bank's outstanding Doing Business sub-national report for India can be found here. It really is a must-read for anyone trying to understand the Indian business environment.